PARIS -- Nissan reacted to a weak 2009 unit sales outlook by announcing plans Thursday to reduce production and cut 1,200 jobs from its car assembly plant in Sunderland, England. The Japanese carmaker said the production slowdown and staff cuts are needed to protect the future of the plant, which produces the popular Qashqai lower-medium hatchback/SUV crossover, Micra minicar and the Note small minivan. "It is essential we take the right action now to ensure we are in a strong and viable position once business conditions return to normal," Nissan's senior vice president for European manufacturing Trevor Mann said in a statement. 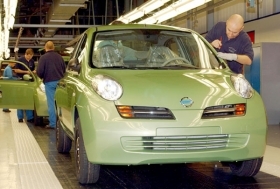 Nissan will cut a production shift from each of its two assembly lines at the Sunderland plant. The temporary production slowdown, which starts this month and will end in March, will limit Qashqai production to two shifts daily while cutting Micra and Note production to one shift a day. Nissan added a third shift to the Qashqai assembly line and 850 new jobs at the factory in mid-2008 in the run-up to production of the seven-seat Qashqai+2. Micra and Note production should return to a schedule of two shifts a day starting in April, the company said. The planned work force reduction includes 400 temporary employees whose contracts will not be renewed at the end of January, as well as 800 full-time production workers to be culled through a voluntary departure program. The Sunderland plant is the UK's largest car manufacturer and exporter, with record production of about 386,555 units in 2008, well above the 353,718 produced in 2007.